Blue Hootzes are common enemies in Donkey Kong Country: Tropical Freeze. They resemble squat blue owls that wear viking helmets with tiny horns. The margins of their helmets slope downward to their beaks, creating the illusion of a frowning expression. They permanently expel blue flames out of their bodies, except when defeated. Blue Hootzes either hover stationarily in the air or fly around in set patterns, and usually appear in flocks of two or more. As they are permanently covered in flames, they are difficult to defeat, being harmful and impervious to even Rambi the Rhino or Cranky Kong's Cane Bounce. The only way to defeat a Blue Hootz is from a distance with a barrel or another throwable object. A Kong POW can also be performed in their presence to defeat them. 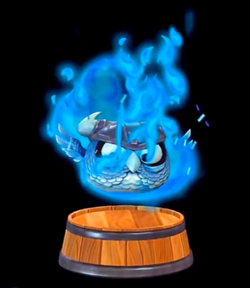 Blue Hootzes function similarly to Zingers, Buzzes and Flaming Tiki Buzzes from previous Donkey Kong Country games. This page was last edited on October 28, 2018, at 20:00.